This is the seventh year that ITWeb Brainstorm has been producing the CIO Directory and it's my third year on the project. I'd like to say it gets easier with practice, but that isn't the case, as every year we work to ensure that the upfront content is forward-thinking and relevant to today's CIO. This year, we've also tweaked the CIO profiles slightly. In addition to recognising their achievements and looking at the evolution of their role, we quizzed CIOs on what they believe are their top personal traits that make them successful. The responses were varied and interesting, although 'being innovative' and 'acting as a mentor' were common themes. We've added another new element to the profile structure, asking CIOs to identify either the biggest issue they faced in the year that's gone, or what they expect to be their biggest challenge in the year ahead. The responses reflected the issues ‘keeping CIOs awake at night', namely budget concerns (particularly relevant in our current economic climate), security threats and the fast-changing pace of technology. The challenges around moving to the cloud and aligning legacy solutions with newer technology are recurring trends, as is the evolving role of the CIO from technology leader to digital enabler across the business. In our upfront articles, this year's topic is the fourth industrial revolution, or Industry 4.0, where humans and the Internet of Things converge. As the nature of how business operates changes, so too will the workforce have to adapt to survive. This means an increasing emphasis on IT capabilities. However, it also means the CIO will have to evolve their role to enable increased interaction with other divisions within the business. It also means the CIO will have to be more vigilant about security than ever before. The concept of work-life balance has evolved into work-life blend, with the boundaries between work and home blurring and overlapping. This keeps pace with the fact that mobile devices are now used for both personal and business use. When paging through this year's directory, you'll notice that the Africa section has grown substantially. In fact we've more than doubled the number of CIOs profiled, providing an overview of the state of the CIO life outside our national borders. Finally, I'd like to thank the team that worked so hard to make the publication happen, particularly Norma, Adrian and Caryn. There's a complete list of the people who contributed to this impressive publication on the opposite page. 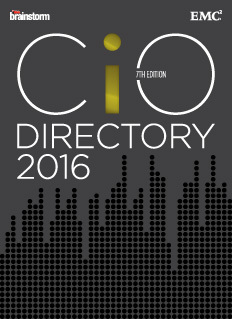 They've done an excellent job this year to bring you the biggest ever CIO Directory. I hope you find it insightful.